WorkFit T: 35" x 23"
WorkFit TL: 37.5" x 23"
The Workfit-T installs easily with no tools: Just take it out of the box and place it on your desk, and you're good to go. Its shape and height adjustment mechanism are optimized for compact offices. Height-adjustable monitor kit saves work surface space and improves users' ergonomic health. Its keyboard platform may be too small for especially large keyboards. The lever locking system doesn't adjust with the same level of precision as other, infintely-adjustable desktop risers. Ergotron's Workfit-T is a superb addition to any office looking for a quick and easy way to convert their employees' desks to a sit/stand workstation. Its ease of assembly and compact design can save facilities labor and space, while the optional, independently-adjustable monitor kit encourages healthy neck and wrist ergonomics while you work. Against the Varidesk, it's a sure-fire winner. And while it lacks some of the adjustability and customizable options of other risers, the Workfit-T is simple and robust enough to take nearly every desk to standing height. When it comes to sit stand workstations, no manufacturer makes more noise than Varidesk. They advertise heavily across the media landscape, and their simple design has caught on among standing workers of all stripes. WorkWhileWalking was the first outlet to review the Varidesk, way back in 2013. At the time, treadmill and standing desks were still catching on in the U.S., and desktop risers were a novel idea. The Varidesk faced little competition, and earned a 5/5 review score. Since then, all kinds of sit stand workstations (a.k.a. desktop risers, desktop workstations or desk converters) have emerged. Products like the Kangaroo, Winston Workstation and Humanscale Quickstand have capabilities and features that leave the Varidesk in the dust. Most importantly, they come with monitor mounts, an ergonomic necessity for any workstation - and one missing on the bare Varidesk. The advent of these improved risers ushered the end of the Varidesk's industry dominance, and we've since revised our Varidesk review to account for these newer, more ergonomic sit stand workstations. 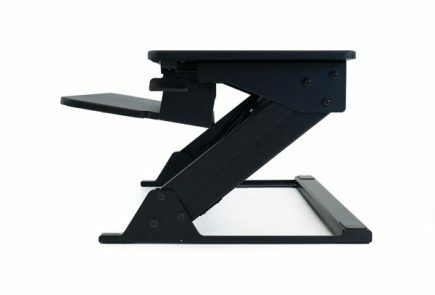 However, these superior desktop risers represent more of a departure from the Varidesk than a direct improvement, and they're not without their own downsides. Installation is more involved for these workstations, sometimes requiring more than one person to assemble. When it comes to a foolproof assembly process (Read: none required) the Varidesk's design has so far managed to thrive unchallenged. 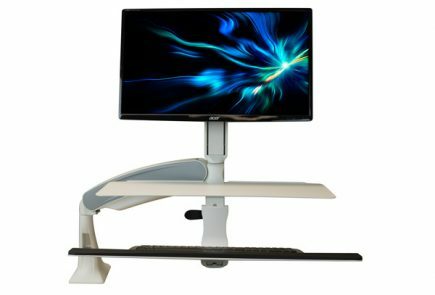 Now, Ergotron, a powerhouse in the field of ergonomic office products, has picked up Varidesk's gauntlet with the launch of the newest member in their Workfit series of desktop risers: The Workfit-T. This new contender takes aim at the Varidesk with a similar no-brainer of an assembly process, while adding some much-needed improvements. 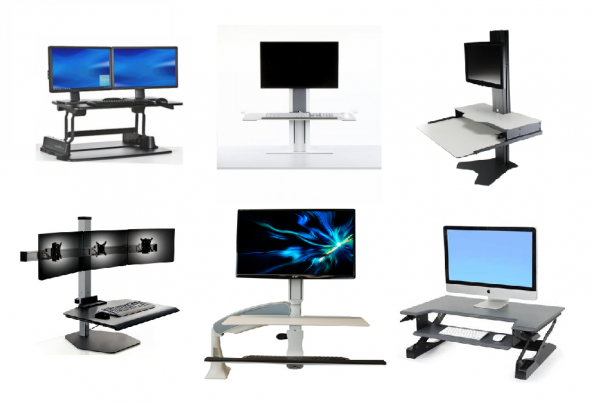 Can Ergotron's new WorkFit-T sit stand workstation unseat the aging Varidesk? Let's find out. Offices wishing to avoid spending time and hassle on assembly will love the Workfit-T. Installation requires no tools and almost no effort—just open the box and place the Workfit-T on top of your desk (add-ons require some installation, but we'll get to that later). Once installed, you can take a moment to admire the Workfit-T's smooth, elegant aesthetic. It has a compact 25" x 35" footprint, making it an ideal companion for narrow desks. It doesn't offer quite as much depth as the Varidesk's 29 inches, but what's there is more than enough for a couple of monitors and a laptop. A cutout in the main surface allows for a keyboard tray measuring 9" x 25". This separate platform acts as a dedicated space for a keyboard and mouse, and is positioned about 4" below the main surface for a more comfortable delta between viewing and typing height. The Workfit-T sports a stylish gray or white finish, with subtly rounded corners and, in the case of the main surface, a beveled front edge. One of the important details about the Workfit-T's surfaces is that they're very smooth. Some other desktop risers, including the VariDesk, Winston Workstation, and Kangaroo, have a sort of stippled texture on their work surface. Putting pen to paper on these surfaces feels a bit like you're writing on your kid's Fisher-Price table. The Workfit-T has a cleaner writing surface which feels more like a real table top. In keeping with the Workfit-T's clear design goal of simple use, height adjustment is a breeze. Two levers positioned under either side of the main surface control the spring-loaded adjustment mechanism. It takes very little force to squeeze these levers and raise or lower the Workfit-T to one of its twenty different height settings—no need to fiddle with any knobs. Compared to the Varidesk's scant eleven height positions, the Workfit-T lets you more precisely set your typing surface to the most optimal ergonomic height for your wrists. Despite its simple design, the Workfit-T is a capable riser, with a 15" height adjustment range—up to a max height of 20" above your regular desk surface—and a 35-lbs lifting capacity. 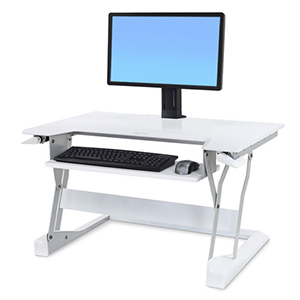 These specifications are similar to other sit stand workstations. Reinforcing the Workfit-T's durable construction is an impressive five-year warranty, which gives us more confidence than the VariDesk's short one-year warranty. Warranty is an important indicator of a product's durability and longevity, and Ergotron's support for its product is a positive sign. One of the VariDesk's shortcomings is its adjustment movement. Raising its height causes the work surface to arc towards you, forcing you to move away from your desk whenever you stand. This takes up precious workspace, makes your desk harder to reach, and makes switching between sitting and standing more tedious; not to mention potentially hazardous if you didn't plan your monitors' cable slack accordingly. The Workfit-T on the other hand adjusts straight up and down. Its footprint is confined to the desk, saving you space around your workstation—a particular benefit for compact offices. Our testers found that switching to a standing position was a lot easier on the T as well—we didn't have to shift our foot rests or standing mats every time we switched. By far the Workfit-T's most remarkable advantage over the VariDesk is its optional monitor kits. 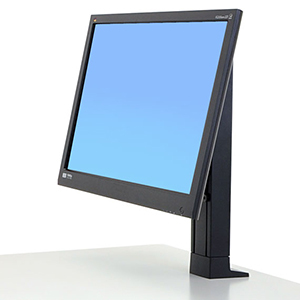 While both the Workfit-T and the VariDesk allow users to place their monitors directly on top of the main surface, only the Workfit-T lets you attach your monitors to an independently-adjustable, ergonomic monitor mount. This kit is available in light- and heavy-duty variants, as well as in a dual-monitor model and a monitor/laptop hybrid. It easily bolts towards the back of the main surface and lifts any VESA-compatible monitor: The light-duty model can lift up to sixteen pounds, and the others can support up to twenty-eight pounds. The monitor kit takes up less of your precious work surface space than just putting your monitors directly on top, so you can bring more of your work to standing height. This monitor kit also has the advantage of being more ergonomic than simply placing your monitors on the work surface. The distance between the Varidesk's keyboard tray and monitors is much too small, forcing users into a potentially painfully contorted T-Rex pose, with their wrists raised high and their necks craned low. The Workfit-T's 5" vertical adjustment range helps keep your monitors at the proper eye level, eliminating the neck strain that comes from "computer hunch," and providing more space between your screen and your keyboard so you can maintain proper wrist ergonomics while you work. Not only is the Workfit-T more compact and more ergonomic than the Varidesk, it's also a lot tidier. To keep your work space neat and prevent the untamed jungle of cords that bedevil many an adjustable workstation, the Workfit-T also comes with its own cable management kit. Included inside are five cable ties, two adhesive cable clips, and a 20"-long cable sleeve for bundling and concealing your cables. The monitor kit comes with hooks for tying your wires to, and the back of the main surface includes a recessed space through which to guide your cables. No matter what height you're working at, this kit will keep your cables organized and secure. With the recent influx of new desktop risers, we've known for a while that the once-great Varidesk design was running out of steam. Now, Ergotron has recreated the Varidesk's ease of assembly, while at the same time dramatically improving upon its performance, stability and ergonomics. With a much-needed monitor mount and a space-saving linear adjustment mechanism, the Workfit-T beats the Varidesk at its own game, and calls to mind the old saying about "pioneers get the arrows in their backs." While Varidesk is a spinoff of costume manufacturer Gemmy, the WorkFit-T comes from a company with decades of experience in designing and manufacturing ergonomic products. Ergotron's Workfit-S, Workfit-A and numerous other sit stand workstations are a staple in the health care industry and other environs. But compared to the larger assortment of desktop risers, particularly the more distinguished models available, the Workfit-T still suffers from a few shortcomings. For one, the Workfit-T's lever-lock system isn't quite as smooth as the infinitely-adjustable, counter-balance systems of other risers like the Kangaroo or Winston. And while the T doesn't have the loud clanging noise of the Varidesk, it still exhibits a clicking sound during adjustment. It's also less precise: 20 height positions is head and shoulders above the Varidesk, but even Ergotron's other WorkFit risers can be set to any point in their adjustment range, allowing you to fine tune the height of your work surface down to the millimeter. Users may also find the keyboard tray a bit constraining: There's plenty of room for most keyboards and a mouse, but if your keyboard has a built-in wrist rest, or has a larger depth than 9 inches, you can expect it to protrude out the front. Finally, while many risers like the Kangaroo let you adjust your monitor a number of ways, the Workfit-T's monitor mount lacks the ability to pan left and right. Of course, that's not to say the Workfit-T doesn't have its own advantages over these other risers as well. It offers more work surface space than a lot of other risers, including the Quickstand and some of Ergotron's other models. 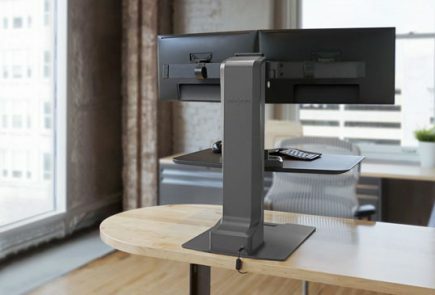 While it does exhibit some degree of shakiness at its taller heights, as all desktop risers do, it's still noticeably more stable than many others, especially counterbalance workstations like Ergotron's Workfit-A and the Humanscale Quickstand. The only riser we've reviewed that's more stable is the Kangaroo, but that is due to its practical-if-inelegant stabilization leg. Moreover, the Workfit-T beats not only the Quickstand but the other Workfit risers in weight capacity, making it Ergotron's resident strongman. In fact, the only riser outright stronger than the T is the Winston. About the only thing the Workfit-T doesn't beat the Varidesk at is price. Its $436 starting price is about $40 more than the Varidesk Pro 36. The monitor kits start at $99, but can run up to $149 for the dual-monitor model. In our opinion, this is a case where it is worth it to spend a little more for better quality. And considering the WorkFit-T's improvements in neck and wrist ergonomics, usability, and space management, it's well worth the relatively small additional cost. Ergotron has recently introduced a new, more spacious version of its WorkFit-T, called the WorkFit-TL. We take it as an answer to the critics, complaining about the T's small keyboard tray. The WorkFit TL adds the 'L' to its name, (we assume for "Large"), and it includes both an upsized keyboard tray and an expanded work surface. The keyboard tray measures 27.5" wide x 11" deep, compared to the WorkFit T's 25" x 9" - so you have a couple extra inches in width and depth for using your keyboard and mouse. And the width of the work surface has grown by a couple inches as well, to 37.5". But Ergotron did not stop there - they are aware that with extra size must come extra power - and the WorkFit TL can lift up to 40 pounds, improving upon the T's maximum lift of 35 pounds. However, it maintains the same height adjustment range, which, at 15 inches, is becoming a bit dated compared to other risers on the market (for reference, the Kangaroo's work surface raises 16.5 inches from your desktop). And it weighs in at a hefty 56 pounds, a 7 pound increase from the T.
For those who want a larger keyboard tray, or some more room for their work surface, the TL makes the superior choice. It carries forward the same impressive stability and solid construction of the WorkFit-T. And now you can even add in a 'tall user kit', a plate that attaches to the monitor mount and boosts the unit's height range. 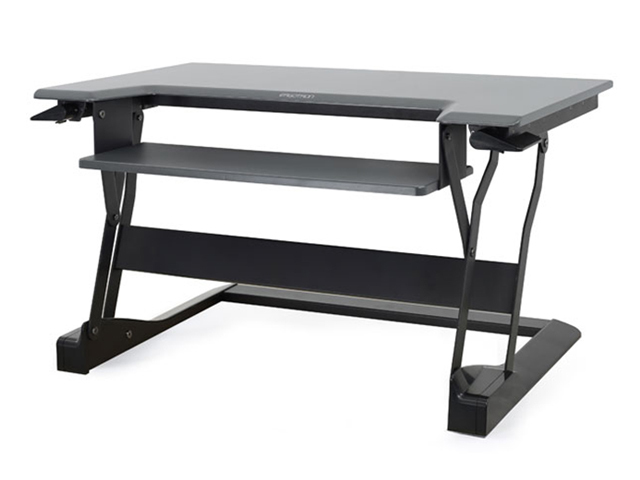 The TL boasts the same 5 year warranty, and, like the T, makes an excellent alternative to any VariDesk on the market. It's an especially able option for larger individuals. We welcome the WorkFit-TL, the WorkFit-T now in 'jumbo size'. The Workfit-T costs $436 and is available in black or white finish. The Workfit-T is backed by an industry-leading 5-year warranty. Did you ever get the Workfit-t in for review. Would be interested in hearing how you liked it or not and if it compared favorably to the Varidesk in use.